Eating clean and green is a really smart decision and everyone should consider a change with at least one meal per day. 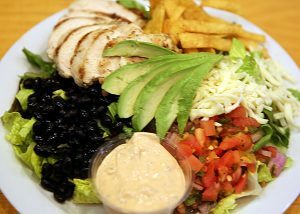 Endsley’s restaurant has plenty of healthy and delicious options that Modesto can choose from. Most importantly, giving back to our own Modesto community is where love can be shown in the greatest fashion. 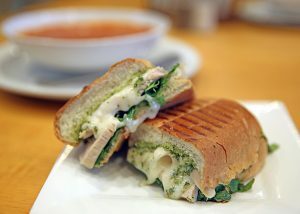 Greens Restaurant is a beautifully quaint and cozy spot nestled right in the midst of downtown Modesto, California. Located at 953 10th Street, conveniently, it is only a hop, skip, and a jump away from Brendan Movie Theater. True to the restaurant name, Greens always serves fresh vegetables, organically grown. The food is rich in an abundance of heart health and heart health means everything to Mrs. Endsley. Make no mistake, the fact that she has a heart for health within the community is no accident. Her husband is a retired physician, Dr. Steve Endsley. Dr. Endsley is the founder of Valley Heart. After his retirement, he and Anne began The Underground Kitchen, delivering healthy meals all over the Central Valley. Now, with the restaurant, everyone can stop by to taste the various menu options. 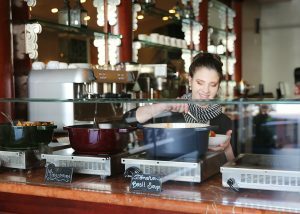 They serve a lot of vegan, vegetarian food, while at the same time, they cook gluten-free, (which is very rare for our area). Preparing that type of food has been one of the main missions at Greens. They have a desire to provide scrumptious meals for people who have special dietary needs. Providing meals with that in mind is no easy feat, so Mrs. Endsley makes it a point to use some of the local purveyors within our community. Even with the success of the restaurant, the main business for Greens comes from their catering side. Some of their clientele includes Gallo, our local hospitals, and large medical groups – serving over 1000 lunches per week. You may be wondering what makes Greens so successful after 8 years of business, (beginning with Mrs. Endsley’s organic farm)? It goes back to the list I began with. Every day, more and more people are re-thinking the food they are putting into their bodies and the quality of the food at Greens has been trusted for many years. Of course, it helps that the meals are spectacular! Most importantly, there are so many entrees to choose from. 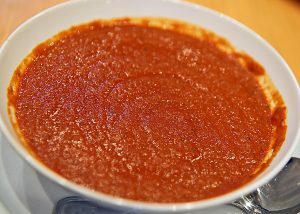 There is the vegan made, Tomato Basil Soup, featuring caramelized onions. Then there is the White Mushroom Lasagna that is to die for. (To get an idea for yourself, just take a look at my favorite photographer, Michael (MJ) Mangano’s photos to see what I mean). 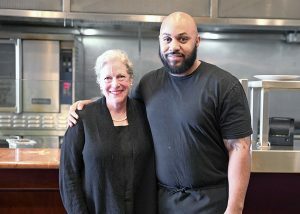 All of the food at Greens is prepared by the Head Chef, Dwain Gullatt, (pictured here with Mrs. Endsley). Chef Dwain makes sure that every bite you take is savored! You should know, the restaurant serves all sorts of items in addition to the healthy alternatives. There is also a house favorite; Macaroni and Cheese! Chef Dwain pairs the macaroni with bacon in such a way that each bite will melt in your mouth! I left out the most important thing that Mrs. Endsley does for our community: She believes in second chances in life and is known for hiring people that may have made a wrong decision along the way. She has another company, called Random Foods and during the summer months, this company helps 18 year olds who age out of the foster care system. This program helps the young men and women learn the skills they need to find employment. 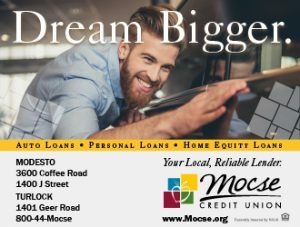 Truly, Ann Endsley has a great love for Modesto and our community as a whole. Her restaurant is a true representation of that fact and this is how she explained it to me, “My main goal is to bring clean, healthy, and delicious food to the community.” What she left out was the fact that she does all of that and more, with a gracious heart and a smile on her face. Ann Ensley is a great lady and you can feel it from the moment she greets you with her bright smile and open arms as she goes in for a long hug. Your meals can always be ordered for delivery by calling (209) 524-7336 or by simply download the app: squareup.com/store/greens-on-earth.